Overuse or repetitive trauma injuries account for approximately 50% of all paediatric sport-related injuries. Overuse injuries occur gradually overtime, when an activity is performed repeatedly without proper preparation and rest time between playing. Because children are still growing they are at a greater risk of injury than adults. As parents we want to encourage our children to be involved in sport because of the known health benefits associated with physical activity. But how do we protect our children from these overuse injuries? 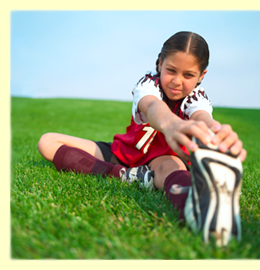 In this blog I will discuss the different types of sporting injuries in children as well as treatment and prevention strategies. These injuries occur at the bony attachment sites for muscles & tendons. They commonly occur during growth spurts due to differing growth rates of the bones, muscles & tendons. The bones grow first, leaving short, tight muscles that pull on the bone and cause inflammation. Site of pain Pain & inflammation at the tibial tuberosity, the site where the patella tendon attaches to the top of the shinbone. Pain & inflammation where the achilles tendon attaches to the heel. Aggravating activities Running, squatting & going up & down stairs due to the pull of the tight quadriceps muscle at the front of the thigh. Running, jumping & walking due to the pull of the tight calf muscle & achilles tendon on the heel. At risk sports Running & jumping sports, particularly those on hard surfaces. Resolution of condition Heals on its own once the growth spurt has ended. Typically within 2 years. Microtrauma can occur to the bones or the muscles due to repetitive strain. When continued microtrauma occurs to the bone it can result in a stress fracture. In children, bone growth is still occurring which means that stress reactions can occur in either the bone or the growth plate. The growth plate is an area of developing cartilage at the end of the bone where bone growth occurs. When bone growth is complete the growth plate hardens and fuses, forming one complete bone. Before bone growth is complete, the growth plates are more susceptible to fractures. If repetitive stress continues, the growth plate can become permanently damaged and lead to deformity. Stress fractures commonly occur in the bones of the foot, the femur (thigh bone), the tibia (lower leg bone) and less commonly in the pelvis and spine. Stress fractures can take between 6 – 12 weeks to heal depending on their site. During that time, the child needs to rest completely from any activity involving the affected body part and may need to wear a brace or cast to immobilise it. Warm up & cool down before & after physical activity. Stretch – Before activity this should be dynamic stretching, where the muscles & joints are moved through their full range of motion. After activity, static stretching can be undertaken, where the stretch is held for around 30 seconds. Have at least one rest day from sport a week. Try to avoid participating in the same sport for the whole year round. Cross training to avoid continued repetition of the same exercise. Treat injuries at their earliest sign. If you are concerned that your child may be carrying an injury or may be at risk of developing one, do not hesitate to contact the team at The Osteopath’s of Heidelberg & Blackburn. During the consultation we will diagnose, treat and create a comprehensive management plan to ensure that your child can safely return to sport. McLeod T et al (2011). National Athletic Trainers’ Association Position Statement: Prevention of Paediatric Overuse Injuries.